Get ready to participate in a free, online symposium to empower adult English speakers of other languages (ESOL) on June 3, 2–5 p.m., hosted by Cultures and Literacies Through Art for the 21st Century (CALTA21). “Using art to develop language and literacy was the theme of a recent two-day institute at the Everson Museum of Art in Syracuse, N.Y. Among the organizers was Amanda Brown, assistant professor of linguistics in Syracuse University’s College of Arts and Sciences. Hortencia Marmanillo spent a few days this summer in a museum, but she didn’t just look at art — she improved her language skills. Marmanillo, who came to the United States from Peru in 2009 speaking very little English, took part in an innovative literacy program, Cultures & Literacies Through Arts for the 21st Century, or CALTA21. She wants to become a nurse, but before she can enroll at CUNY she has to improve her English skills so she can pass an assessment test. 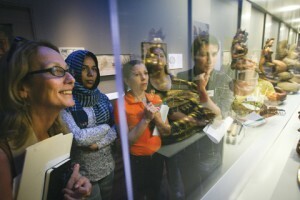 The program is unique because of museum trips where adult students, for whom English is a foreign language, are encouraged to describe the works of art they see, engage in conversation with other students and explain what they like or dislike about the art. Incorporating visual art into teaching literacy works wonders in the classroom, says Patricia Lannes, CALTA21 co-founder and project director. With their diverse backgrounds, the students include their cultural and life experiences in interpreting art and become curious about cultures they haven’t yet explored. “It’s very innovative,” says Lannes. “Its innovation and uniqueness lies on the use of images and students’ prior knowledge and rich experiences as immigrants as a springboard to acquire new skills and knowledge in a museum setting. When “reading” a work of art they incorporate their personal experiences, learn from their classmates’ comments and have meaningful conversations in an art museum. They also learn how to navigate a museum and what kind of resources a museum can offer them.” The museum discussions help students build their English vocabularies, practice conversation, articulate interpretations and develop critical-thinking and conversational skills. Queensborough Community College is the lead institution for CALTA21. Several New York City museums, including the Rubin Museum of Art, the Katonah Museum of Art, El Museo del Barrio, and the Godwin-Ternbach Museum at Queens College are partners. VUE/ Visual Thinking Strategies, the Literacy Assistance Center and CUNY Language Immersion Program (CLIP) are part of the effort. QCC received a National Leadership Grant of $495,000 from the Institute of Museum and Library Services to run the program from October 2011 through September 2014. The goal is to eventually implement CALTA21 in Adult Literacy Programs across the nation. “Students are eager to look at art, they ask to look at more art when the class is over,” says Lannes, who came to the U.S. from Uruguay at age 24 with a basic knowledge of English. After students visited the Museo del Barrio, they returned with family members eager to show them around and act as tour guides. “That’s a good sign that they want to show their family and friends what they have learned,” says Lannes. “Art takes students into a different world.” It’s also about “using visual skills to develop critical thinking and literacy skills that you can apply to anything, including a college paper,” she adds. So far, the response from students has been positive. Building a vocabulary at a museum is more engaging that drilling words by repetition at home or in a classroom, they say. Recently, Marmanillo was eager to share the some of her expanded vocabulary she acquired on a visit to the Rubin: Extravagant, ambience, complexion, body language and costume are just a few of the new words she learned while describing a painting of a Buddha. This article is reposted from the Winter 2013 issue of CUNY’s Salute to Scholars publication. To view the article on the CUNY Newswire blog, click here. To view the .pdf of the original issue of Salute to Scholars, see page 6 of the publication found here. A discussion on the CALTA21 professional development institute at the Rubin Museum of Art, from their official blog.